Friends of the Earth has revealed the frontlines of climate change in England today (26 November) to mark the 10th anniversary of the Climate Change Act and the urgent action still needed to prevent runaway climate change. Communities around Saddleworth Moor have been included in this list, due to the extreme wildfires of summer 2018 which spread rapidly as the heatwave turned the moorland into a tinderbox. Moors such as Saddleworth burnt for days on end; leaving them as charred husks, ruining ecosystems, threatening local towns and increasing air pollution. Weather attribution scientists estimate that the probability of the heatwave of summer 2018 was generally more than two times higher than if human activities had not altered climate. With a greater risk of summer heatwaves, we may well see wildfires become a far too regular threat if more action is not taken now to reduce emissions and avoid further climate chaos. “I was cycling home from work in Manchester to Mossley and I could see the smoke rising above the hills. As I got within a couple of miles of home, I could smell the smoke as well. “I spent the night watching the fire front sweep down the moor nearby. The next day saw the full severity was becoming apparent, with calls from the local Fire Brigade for donations of bottled water, energy gels and snacks initially, and a few days later caps, socks and other items. My running club quickly organised a collection of energy gels to deliver to the Stalybridge station, and the whole community quickly came together to donate everything they could as it was asked for. “For the next week the valley was shrouded in thick smoke, especially at night as the winds died down, and during the day, helicopters were routinely dropping water on fresh outbreaks in areas where the fire engines couldn’t get to. “These fires are always a risk, but an increased frequency with an already stretched fire service is always going to be a worry. 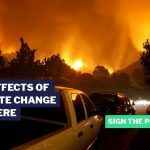 “The government must wake up to the fact that climate change is already having awful consequences for communities, with the memory of the extreme wildfires on Saddleworth Moor all too fresh. If we don’t see the necessary action from the government soon to prevent further climate chaos we are going to see a greater and greater risk of such flooding becoming a regular occurrence. From Devon to North Yorkshire, the communities on the frontlines are already facing the effects of climate chaos and are the ones most at risk of further catastrophe. Coastal communities in Norfolk falling into the sea. Communities such as Happisburgh have seen as many as 35 homes claimed by coastal erosion in the past decade. Local campaigners have repeatedly appealed for more government assistance, but this has been refused and obscure laws means that compensation has been refused for those who have lost their homes to the sea. Moorlands in the North West being turned into tinderboxes. Soaring summer temperatures in the UK led to moors such as Saddleworth burning for days on end; leaving them as charred husks, ruining ecosystems, threatening local towns and increasing air pollution. With a greater risk of summer heatwaves, we may well see wildfires become a far too regular threat. York and Leeds disappear under flood waters. York and Leeds saw devastating flooding off the back of Storm Desmond in 2015 (at the same time as world leaders attended the climate talks in Paris) which led to people having to be evacuated by boat as water levels rose higher and higher. Scientists concluded that climate change had made the flooding 40% more likely. This likelihood is only set to increase if steps are taken to cut emissions. Farmers facing heatwaves and droughts. As well as extreme flooding, UK farming is also threatened by the risk of regular summer heatwaves, like those seen this year which left farms across Surrey, Kent and East Anglia parched after weeks on end with no rain. Crop yields were lowered, which again has serious implications for future food stocks and prices. Devon and Cornwall’s coastal railways collapsing into the ocean. Brutal Atlantic storms led to the collapse of a stretch of sea wall at Dawlish Warren – taking railway track with it. This left the main trainline connecting the region to the capital out of action for months. The impact on the community was all too real, but we must also consider the wider ramifications of key transport lines being disrupted by an increased number of extreme weather events in the future. A full spending review to ensure the path to net-zero emissions is properly funded, following the Chancellor’s disastrous Autumn Statement which failed to make any mention of our deteriorating climate. Double the area of land forested, creating three million more hectares of forest. This will take carbon pollution out of the atmosphere and provide space for nature. The recent land use report from the Committee on Climate Change lacked the ambition needed on tree planting and restoring peatlands. Bring forward the date for phasing out the sale of petrol and diesel cars and vans to 2030. Our cities and towns will be transformed and will resemble places such as Copenhagen and Amsterdam which provide high quality public transport, cycling and walking. Fully decarbonise our energy by generating 8x more renewable electricity than current levels. We must vastly boost offshore wind projects, while removing planning blockers which are preventing on-shore wind energy from reaching its potential. This will also need the rapid development of decentralised rooftop solar power, and proposed changes in the feed-in tariff that threatens the viability of roof-top solar and solar farms to be reversed. Renewable energy like this has huge promise for UK exports and job creation. Provide funding for householders to enable them to install insulation and low carbon heating, as part of an area by area coordinated action plan. UK food waste to be halved by 2030. All waste to be minimised and reused or recycled as part of a circular economy. For more information contact the Friends of the Earth press office on 020 7566 1649 / 07718 394786 (out of hours – please do not text this number) media@foe.co.uk. The list of climate chaos frontlines is based on recent extreme weather events and wildlife declines which academic study has concluded were made more likely, or more extreme, by climate change. Scientists conclude the probability of the 2018 European heatwave is generally more than two times higher today than if human activities had not altered climate. The paper provides one pathway for the UK to achieve ‘net zero’ greenhouse gas emissions. It builds on the sectorial scenarios developed by the Committee on Climate Change for the fifth carbon budget, while taking into account more recent developments in technologies such as electric cars and also research more recently published into negative emissions (removing carbon pollution from the atmosphere). It suggests that the UK as a whole may be able to – with ambitious policies, fair wind and political leadership – achieve ‘net zero’ by 2045 or even earlier. Ten years ago Friends of the Earth supporters demanded action. They led an incredible campaign to persuade MPs to take climate change seriously. And the government responded with the Climate Change Act – the world’s first law to cut greenhouse gas emissions. Since then, CO2 emissions have fallen by 43% compared to 1990 levels. But official advisors say that the UK is not on track to meet future ‘carbon budgets’. Friends of the Earth believes the government has let slip its climate leadership through its relentless pursuit of fracking, airport expansion, and faltering support for renewable energy. If we don’t urgently depart from this damaging, high carbon pathway, the UK will not be able to meet emissions targets in the next 10 years, let alone do what we need to do stop runaway climate change. Friends of the Earth is an international community dedicated to the protection of the natural world and the wellbeing of everyone in it. We bring together more than two million people in 75 countries, combining people power all over the world to transform local actions into global impact. For more information visit: https://friendsoftheearth.uk/ follow us at @friends_earth, or like our Facebook page.